My friend Sam and I sat at the pub, munching on loaded cheese fries. Sam is a content editor for a small, independent publishing company. The company wasn’t doing well. It believed in the works it published but had trouble finding buyers for the material. As in most small businesses, Sam wore more than one hat. In addition to editing, she was tasked with managing the business’ social media accounts. This was her problem: She believed that selling, and by extension social media, didn’t reflect the goals of their brand. She saw social media as being vanity focused. It’s true: Social media is filled with pointless ego stroking and unrelenting consumerism. But here’s the reality: If your small business is adding to that noise, then you’re doing Social Media wrong. Our day is filled with advertising from every angle. We are exposed so much to it that we have become inoculated against it. We resist it. We click to close, scroll past, and tune out. I don’t like being ‘sold’ to, especially not while browsing social media. I use these platforms to connect to people I’m interested in. Why should it be any different for my business? Businesses with bad social media strategy forget our presence on these platforms is an extension of who we are as people. Would you sell, cajole, offer discounts or promote obnoxious suggestions like “Rainy Mondays are the best days to get a latte!” if you were posting on your personal feed? So why do we act differently when managing a business account? We spam post because we feel pressured to promote. Or, just as bad, we post infrequently until something comes up, like Small Business Saturday or a big event. We respond with a flurry of poorly-timed sales material only to hear the sound of crickets in response. It isn’t the platform isn’t to blame for the awkwardness- small business owners are missing the point of social media. Like my friend Sam, they misunderstand the possibility because they are responding to the pressure. This reactive nature causes them to miss out on the relationships social media was designed to build. In this article, I’m diving deeper into Instagram. Right now, it's the best platform for creative businesses who shudder at the thought of direct sales. Is your business right for Instagram? Check out my Instagram Essentials article covering what type of business’ thrive on this platform, the basics behind reading your analytics, and tips on creating responsive content. Instagram is NOT a sales platform. Some social media platforms, like Facebook, lend themselves well to both advertising and marketing. Here’s why spending money on Facebook Adverts works. Why? Instagram wasn’t designed to be monetized. Instagram is a place to showcase, tell stories, and build your brand. Only recently has Instagram’s parent company, Facebook, connected the platform to Adverts and started to push sponsored content on the platform. Facebook also changed the platform’s content display from showing posts chronologically to….whatever crazy metric of the week they feel like. Even with these changes, Instagram’s design is still too simple to be monetized well. Posts show up in the feed as a single image with caption text that requires additional action to see if it exceeds 140 characters. In addition, Instagram’s users choose this app because its streamlined layout doesn’t work with online direct sales methods. There are no banners or pop ups. It doesn't draw you into an endlessly scrolling sales funnel. The platform isn’t set up to sell and the user base doesn’t want to be sold to. What is Instagram good for? Or- marketing. Instagram is a visual serial-novel that connects, builds, and binds you and your fanbase together. Here’s how to use it to tell a story that draws dedicated fans into your business. 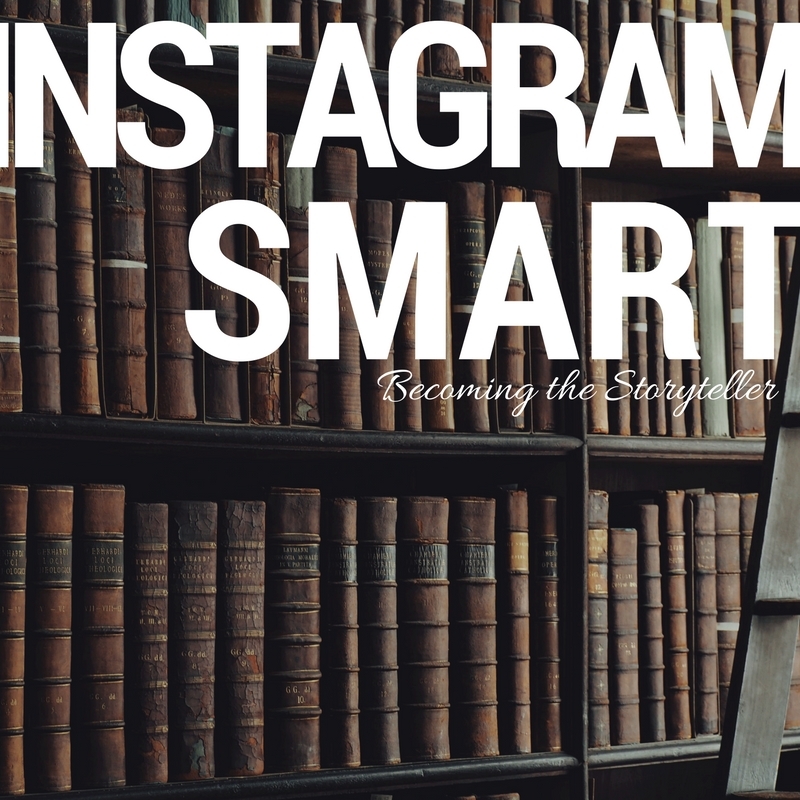 How to use Instagram to create your ongoing story. There are many strategies you can use a strong Instagram account. Crafting an engaging Instagram is like writing a novel. Your main plot is what your business does. Social media strategies that work aren’t focused solely on telling this one story- especially when your ‘main plot’ is obvious. Maeva’s Coffee sells coffee. If we only post photos telling people to “buy this seasonal latte” or “come to this coffee event”, our Instagram becomes pointless. Users quickly become uncomfortable when they come across inauthentic accounts on their personal feed- and just as quickly block them. Instead of focusing on your “main plot”, choose 3-5 themes to focus on in your posts. Only one of these has anything to do with a coffee shop. The rest could be themes from any shop or anyone’s personal Instagram. Here are three common questions I get when consulting with small businesses on how to build an engaged social media audience. Choose something you care about. How? Scroll through your camera roll and look at what you take photos of. The things that cause you to stop, pause, and capture an image are going to be an extension of you- and, by nature, your business. Authenticity is an extension of what we organically engage with. People buy from people- not businesses. Showcasing your behind-the-scenes life might fit perfectly in your business. 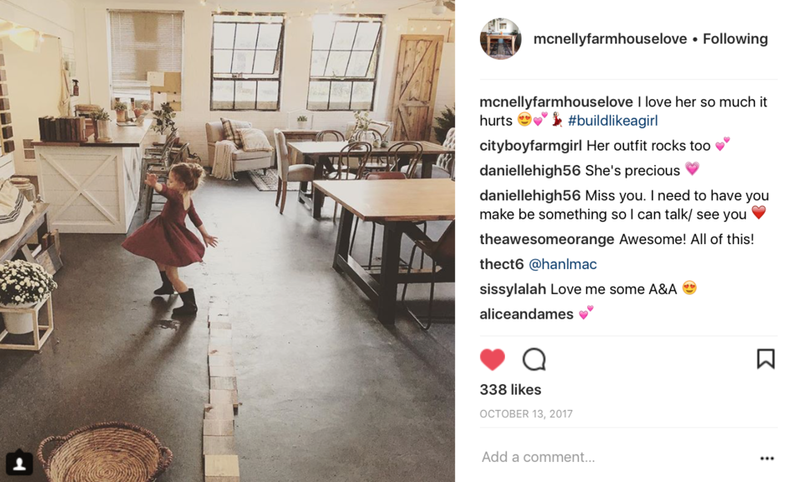 My favorite local example of showcasing the family aspect of business ownership is McNelly’s Farmhouse Love on Instagram. At first glance, “kids” and “furniture construction” don’t seem to go together. But Laura’s story shows the hidden side of what it’s like to build a production business and raise a family. The dynamic is beautiful. Let’s take the principle taught in question one and reverse it. Instead of looking through your camera roll, look at the photos your business is tagged in. Ask yourself how these photos communicate what people are experiencing in your business. What are they looking for? How do you fit into their story? Treat this like a plot twist. Traditionally plot twists are designed to answer questions before the reader thinks to ask them. By finding out what people communicate your business with you find out the story people want to tell with it. Plants are a theme in the Maeva’s Instagram. How does that fit in with a coffee shop? Most coffee shops frame their Instagram around customers or, more specifically, having a lot of them. Who wouldn’t want to showcase how busy their shop is? It feels good on your ego! The busy times are great but my favorite moments behind the counter are when I witness moments of solitude. When I see someone nestled into a corner, reading a book, or just looking out the window at the sky with a warm latte in their hands. I cherish those moments in my own life. Knowing that I’ve created an environment where other’s enjoy creative solitude feels like a private achievement. Plants connect us to that same experience of solitude, steady growth, and understated beauty in life. 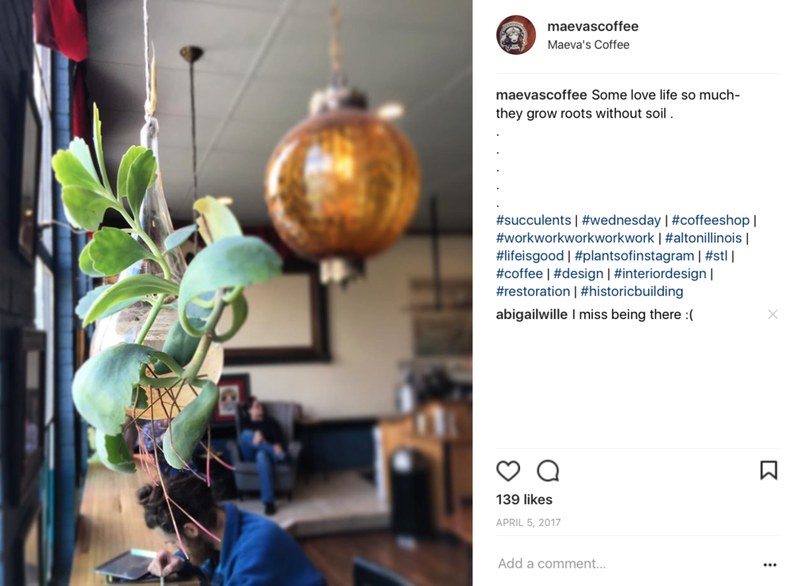 The “plants” theme on the Maeva's Coffee Instagram carries this theme throughout the entire experience. This includes captions with minimal text to tell a simple story of quietness, stream of thought, and the human-stuff we experience on a deeper level. There’s no need to explain this to our audience. The people who connect with these visual moments already feel it. Remember: Not every post fits every follower! Look at the number of followers you have. Is it 100? 1,000? Can you wrap your head around how many extraordinary, dynamic, multifaceted, different individuals you’d have if they were all gathered in a room? Using themes to showcase different aspects of your own business’ personality will help you connect with different groups of people in your base. Going for widely accessible posts, either with the hope of blanket-attracting a larger fan base or appealing to the greatest portion of your existing base, is a sure-fire way to post a flop. We are in a niche economy. As mentioned in the start of our social media series, your social media goals shouldn’t include getting more fans, but building ongoing relationships with the right people for your brand. Step Three: Rotate through themes day by day. Never post two photos of the same theme back to back. If you go through creative spurts where you take 100 plant photos all at once, save those photos in a file to use when you aren’t feeling creative. Having a file of material to draw from is a great way to create a consistent, balanced story. Remember a balanced story is an honest one. Does all this attention paid to crafting a story take away from its authenticity? I’d say not. A social media account is only as authentic as the person behind it. The methods you use won’t make you more or less ‘real’ in the eyes of your base. Choosing to be an honest story teller is what will set you above the sponsored content and needy-sales posts in Instagram’s feed. In college, I played classical music at a semi-professional level. I was even paid to sub in some well-known regional orchestras. Classical music is 99% behind the scenes- hours spent in a practice room or at rehearsals that drag late into the evening. We’d invest hours to hone a piece, perfecting the phrasing and working together create a work of art that connected emotionally with the audience. Did the audience think our music was inauthentic because it was created with intention? No. On the contrary, I’m sure we there would have been some raised eyebrows if we had just “winged it”. Authenticity in social media should be a big concern for small business owners. We feel guilty for promoting things we are proud of, and feel pressured to use live video or Instagram stories to balance any doubts. There will always be fiction and nonfiction. An absence of detail isn’t a lie. Remember, a great biography isn’t fake because it doesn’t include every exacting detail of a person’s life. Great stories use detail to draw us in. The right amount brings flavor to the story but leaves space for the reader to connect the story to ourselves. When we categorize Instagram as a tool for storytelling rather than selling, we create opportunities for real, human connection through our business’ social media experience. You are writing the greatest biography you will ever live- the story of you and your business. Don’t be afraid to tell it!